Already this morning, I have done two loads of laundry, changed the sheets, fed the hummingbirds, watered my plants and cleaned my 30 gal fish tank. All by 0800. Now I'm tired. Next weekend I need to clean my house. It's at that point again where the tumbleweeds of fur are starting to takeover. This morning I counted eight hummingbirds! I'm betting I have more than that, but I personally saw at one time, eight hummies buzzing around my house. I absolutely love that! When you pull into my driveway, you see all these tiny birds just zipping around. They buzz me when I refill their feeders. I've been doing this for 12 years now and I have no idea the life span of a hummy, but by now they are used to me. I talk to them. I'm pretty sure I've already told you this. Two weeks from today (at least the day I'm writing this) I'm on vacation. WOOHOO! Off to Canada to fish my heart out. I will definitely show you guys pictures like I do every year. The sun finally came out for today's mani. You ought to know what that means right? Yup holo time! I just got in some new brown polish and I just had to play with them. You know how I just live for brown. 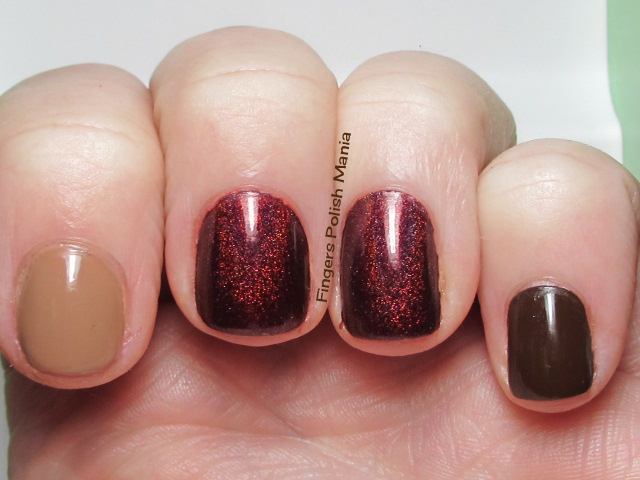 This is Zoya Flynn and Louise with Glitter Gal Belgian Chocolate in the middle. I have been lemming this Glitter Gal for quite some time now. I started with a skittlette of these awesome browns. Here are the starting shots. 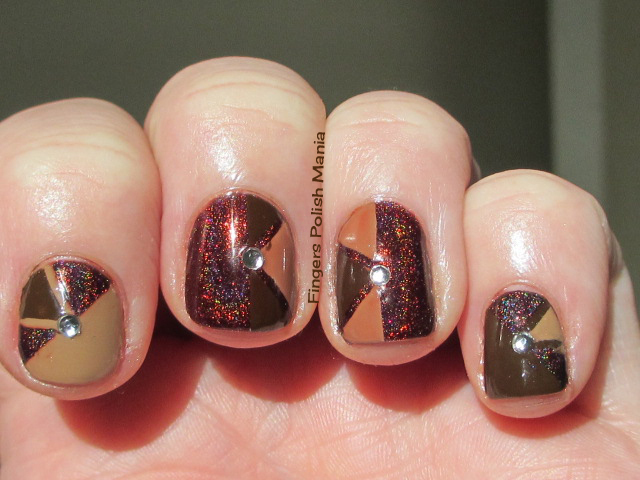 This Glitter Gal is a stunning reddish brown holo. The Zoya are amazing as well. I'm sure you've noticed the nubs have returned. I also did not do straight squares this time. I want to see if it makes a difference. These are more sqouval. Next I placed a bunch of tape. Here is that step. Next I filled in the spaces with the different browns. Here is that step. I was so excited to play with these new browns that I didn't really think about how they'd go together. 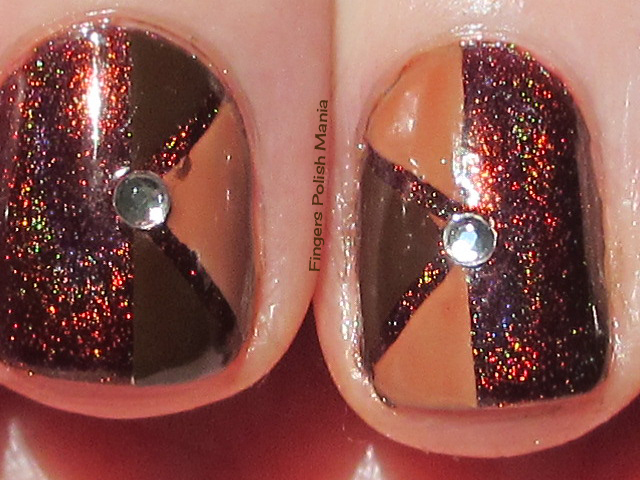 The pattern ends up being hard to see on some of the nails. Next I did some clean up. Yeah, not my best color choices. I did some more clean up and added studs to the center. Here are the results. Even though it's hard to see, I am in love with this. Because it's brown!!!! 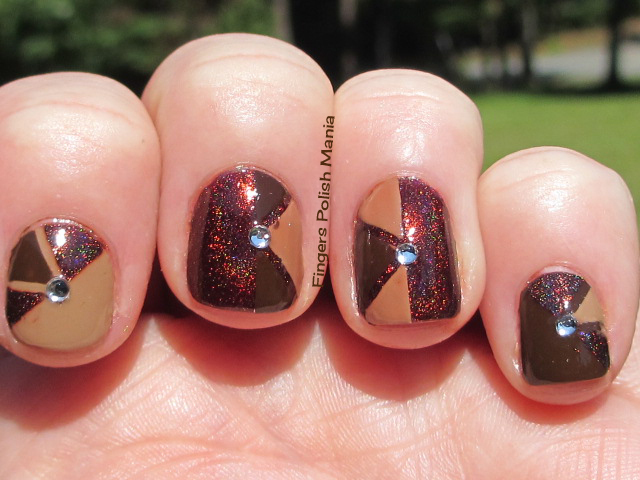 Plus that holo is amazing. 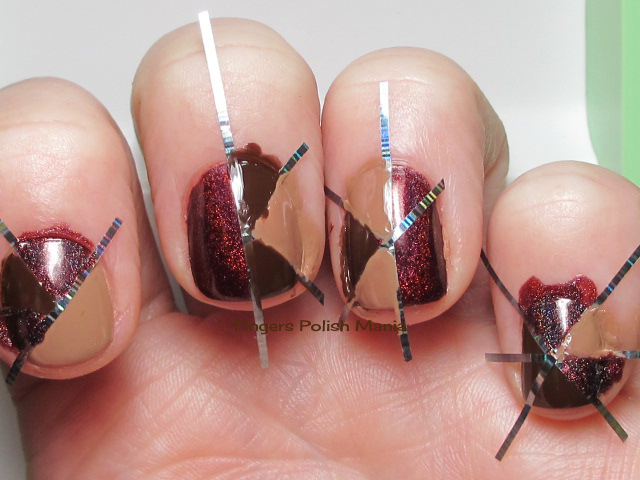 I am having fun doing these tape manis. I really need to try gradients at some point. It's on the horizon.